Making sense of a large amount of information is a complex activity that can be enhanced through the use of active reading on handheld devices and a wall-sized display. This thesis describes the design of a multi-device application that allows the exploration, organization and appraising of numerous documents. Knowledge workers, such as scientists, journalists or analysts have to work with large numbers of documents in their daily work. The task they perform is not merely active reading, but rather sensemaking. Among active reading, sensemaking involves several other subtasks, which could be supported using a wall-sized display. These tasks might be supported by offering a means of externalization, intuitive clustering of documents or search for related documents. 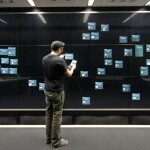 This thesis describes an interaction design using a large interactive display wall and tablets to support the process of sensemaking. Readers engage in active reading using a tablet to extract critical information and create external representations of their document collections on the interactive display wall. Numerous studies on the reading process of knowledge workers have been conducted. 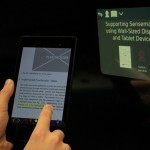 There is already a variety of tablet-based active reading applications, both academic and commercial. Therefore, the focus of this thesis is not primarily active reading on tablets, but rather the possibilities of exploring documents and externalizing extracted information provided by a large interactive display wall. Leveraging the extensive space of the display wall together with the reading comfort of tablets makes it very affordable to handle many documents at the same time, while keeping the overview. This thesis discusses several interaction design concepts, which are meant to support different sensemaking subtasks. 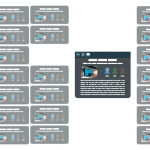 A multi-device prototype application has been devised, combining familiar features of an active reading application with a document collection- and exploration- visualization for wall sized displays.